The Cyrodiil Vampirum Order is Cyrodiil's native vampire clan. A ruthlessly effective sanguipolitical faction, the Order has monopolized vampirism within the province, ousting all other bloodlines. Members are experts of concealment and political manipulation, having infiltrated almost every other faction in Cyrodiil for their own gain. The Order is few in numbers, as it uses its ensconced position to recruit only those it deems advantageous – powerful politicians, skillful diplomats, resourceful spies, etc. Their presence is semi-accepted in the Imperial political sphere, and some Imperials work their entire life to catch the attention of the vampire elders. The Order considers itself far superior to provincial bloodlines, and demands a strict policy of discretion and civility of its members. The Order honors two main patrons: Molag Bal, who is the source of their vampiric infection, and Clavicus Vile, who taught them the arts of concealment and social manipulation. Most Imperials are vaguely aware of the existence of the Order, and believe them to be one of the many shadowy secret organizations who manipulate their lives for their own gain (such as the Psiijic Order, Blades, Temple Zero, or Moth-Eaters). There are very little coordinated attempts to persecute vampires - nor do many see the need for one. The presence of the Order is simply one of the many aspects in Imperial politics which might hinder or benefit one's goals. Since these vampires are so adept at concealment, they see no need to hide in caverns or ruins far from civilization. Most vampire lairs are in the cities, usually located in or underneath the luxurious houses of infected plutocrats. Vampires either reside here, close to their faction services and blood cattle, or as individual undercover agents in any number of locations. For rank 9. I feel "Elder" would be more appropriate. And with the Order preaching discreetness among it's members, I feel like the head honcho's identities would be kept secret, even from the other high ranking members of the Order. Maybe the Informers are responsible for receiving "dead drop" letters from the Sovereigns and are responsible for relaying them to the Monarchs. I would like to add that the Manifesto Cyrodiil Vampyrum states that not all members of the Order honor Molag Bal, so it is safe to assume that Clavicus Vile has more domain over them than Molag Bal does, especially since Clavicus Vile is most responsible for the Order being so powerful. Since the Order is a very realpolitik-oriented faction, I suppose they entertain all kinds of religious sentiments: some oriented to Bal, some to Clavicus, and a large number who don't care for anything but the power their transformation grants them. Religious sentiments will probably be more important the higher one climbs in the ranks. Secrecy surrounding the upper ranks is also a given: these guys were so good at keeping secrets that they forgot the very name of their organization, after all. I feel like the religious settlements that are devoted to Clavicus Vile would be more superior and "classy" than the ones dedicated to Molag Bal. But due to Clavicus Vile granting them the ability to blend in with their mortal neighbors, and their manipulation of Imperial society, that's just the way I see it. That looks amazing, but members of the Order are indistinguishable from mortals when they're well fed. Unless the elder vampires don't feed on blood due to remaining underground. It's just a concept art with design, there is no point of portraying vampire while he hides. How do these vampires remain hidden? If they embrace prominent citizens of the Empire and live inside cities, surely people would notice that they do not age. Are they accepted to an extent where it doesn't really matter and everybody knows you are a vampire? Or do they somehow retire from public life after some time to hide the fact that they do not age? It should be properly worked through, so it wouldn't raise any questions on how exactly the system works. I think when you are fed, you should have smaller power "Mask of the Mortal", which hides your vampire face, allows you to go into sun, but also removes all the benefits of vampirism. Essentially, you are able to remove your vampirism at your convenience, but only if you are not hungry. Once you get hungry, you lose the power and automatically turn into full-fledged vampire. How exactly the hunger system is going to work is another question. There are no sleeping NPCs to feed upon like in Oblivion. 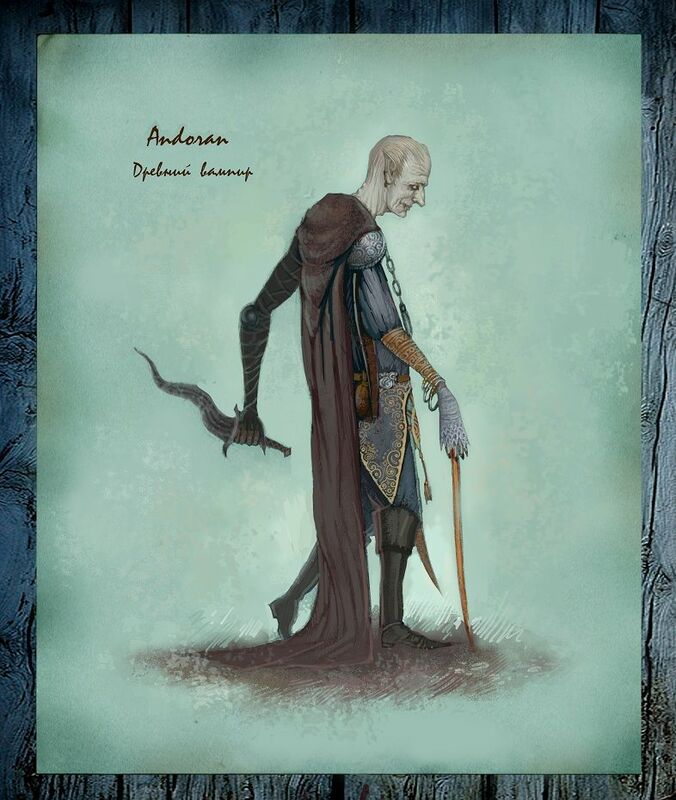 I am personally a huge fan of Vampire Embrace mod, but it might be a bit too complicated and detailed to incorporate similar features in P:C.
I think in Oblivion Janus Hassildor's lengthy age was officially credited to him being a powerful sorcerer. I believe dialogue in Morrowind mentions that the Mages Guild is rumoured to help vampires keep themselves secret. I could see vampires using the Mages Guild to back them up on the whole "I'm just extending my life with magic" ploy. About staying hidden: the lower ranks have little problem with this, because almost all of them are spies. They infiltrate a faction, stay for a short while, and move on to another city/faction if their position starts becoming untenable. None of them should stay anywhere long enough that their age becomes a problem. The upper ranks are different: most of them are active in the Imperial City, at the Arcane University or the Emperor's Palace. The average Imperial dignitary is already pretty strange, so it is unremarkable that some would never leave their office in the day (some administrators live in their office) or that they do not seem to age (magic, illusions, cosmetics, drugs - the Imperial City is overrun with expensive ways to halt old age). One of the main advisors of the Elder Council, Nu-Hatta, has been around for centuries: people just blame it on the moths. Some dignitaries are rumored/known to be vampires, but the Imperial elites are pretty nonchalant about it. The highest ranks, lastly, no longer come out in public: I imagine that, after several centuries, the mask of Clavicus starts to slip and they can no longer hide their nature - nor do they feel the need to, as all humanity has drained from them long ago. In fact, the concept art you posted is a perfect fit. These guys hide out in their secret bastions, manipulating the rest of the faction from afar. About the hunger system: that is pretty much how I would like it to work. Morrowind vampirism is hard-coded, so we can't use it. Among other things, we cannot use the face change system. Luckily, we also don't need it. The system wouldn't work with a lesser power (too complicated to script), but with dialogue conditions: when the player is well-fed, they can walk in the sun and converse with everyone, but starting from the second or third stage of hunger people become uneasy, until they refuse to talk to you. This also fixes the big problem of Morrowind vampirism, that you cannot actually play the game as a vampire. For feeding, the player would be have to rely on bandits, or the blood cattle in the Order's secret town bases. Part of the appeal of this concept for the Order is that is turns the faction into a meta-vampire, leeching off of other factions. I am okay with such explanation, it makes sense. As for gameplay interpretation, I would be okay with such, but if OpenMW does give more options later down the road and if we decide to switch (who knows? ), it might be a little more elaborate. Not much more, but I would love to at least see some visual effects of hunger, at least a face change or something like that. The only thing I personally wouldn't like to copy from Oblivion/Skyrim is growing stronger with hunger, which just doesn't make any sense. That is why I kinda proposed an alternative with the mask, so you don't get your full power out in the sunlight, while being hidden. But how exactly to do it best with Morrowind scripts, I am not sure. I'm with you on that. One thing I really dislike about Porphyric Hemophilia is how you gain more vampiric abilities as you become weaker and advance through the stages. Personally, I think Oblivion should have made it to where as you feed more, you become stronger, and unlock those abilities as you progress. Hopefully, something similar to that is used.